How do you benefit from using the Apiant SMS & Voice Plugin? APIANT is an API Integration Platform for Integration Specialists, IT Managers, SaaS Companies and Enterprises. With more than 15,000 apps listed in its catalog, APIANT has more APIs ready to be integrated and automated than all other API integration platforms combined. There are 2 plugins available in Apiant. 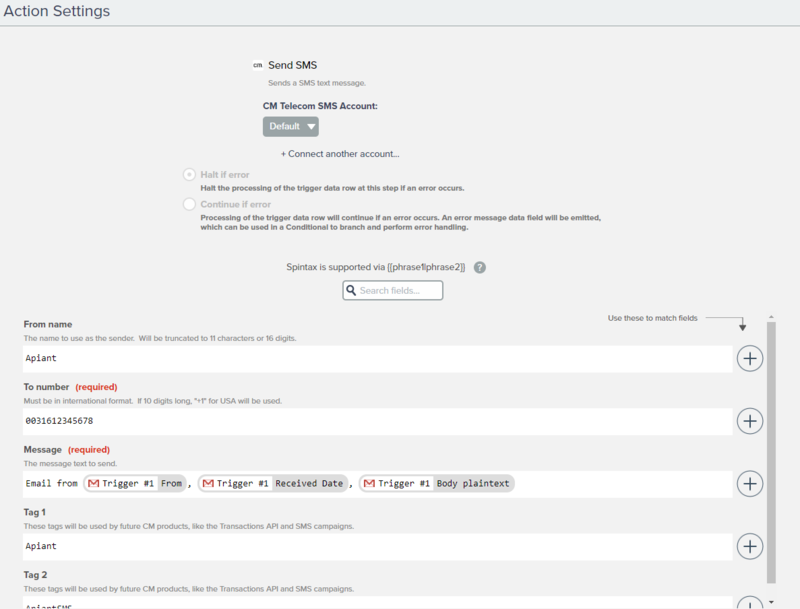 The first connects Apiant to the CM SMS API. With the second you can connect Apiant to the CM Voice API. Keep your database clean by validating phone numbers when they are entered. Optimize your reach and conversion rates by adding voice to your messaging communication channels. With the revolutionary Integration Platform as a Service (iPaaS) Apiant it's very easy to integrate the SMS and Voice API from CM. Next to API integration, CM also prebuilt an Apiant connector for outbound and inbound SMS, an Apiant connector for Phone number verification, an Apiant connector for text-to-speech and notification triggers when an SMS or status report is received.